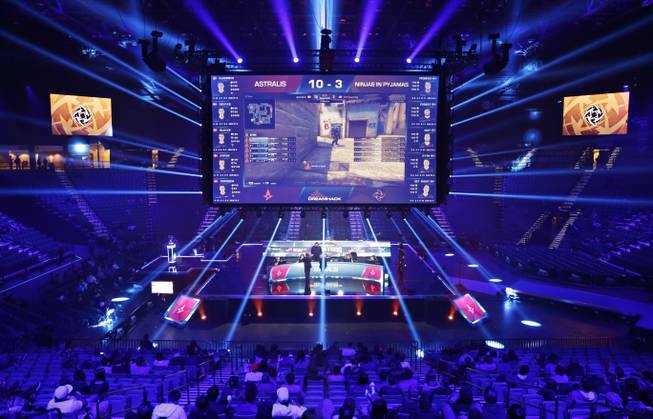 Teams compete during the Dreamhack Masters e-sports tournament Feb. 17 at the MGM Grand Garden Arena. The Las Vegas Strip is getting its first space dedicated for competitive gaming when the Luxor transforms its nightclub into a multilevel e-sports arena. MGM Resorts International on Tuesday said the venue is expected to open in early 2018. ATLANTIC CITY, N.J. — Casinos are slowly embracing competitive video game tournaments as a way to help their bottom lines, but the money is coming from renting hotel rooms to the young players and selling them food and drinks, not from turning them into gamblers. Like most other ways gambling halls have tried to attract millennials and their disposable income, it hasn’t been easy. Atlantic City was first city in the nation to adopt skill-based slot machines to woo millennials but bailed on them after a few months when the response was underwhelming. But it’s been difficult to move them from the video console to the craps table. “Everybody’s still trying to figure out, how do you make this appealing for the consumer and make sense for the business? How do we all profit from this?” said Kevin Ortzman, Atlantic City regional president for Caesars Entertainment, which owns three casinos in the city. “We had a tournament in Vegas, and that was the first time I went to a casino, so ever since then, I’ve been gambling quite a bit,” he said, listing blackjack and roulette as favorites. Alec Collins, of Piedmont, South Carolina, who goes by the competitive name Shock, is only 18, so he’s three years away from gambling legally. But it’s something he’d like to try then. “I love Atlantic City so in a few years I would definitely come back and experience the casino a little bit,” he said. One of the biggest supporters of esports among casino owners is Seth Schorr, CEO of the Downtown Grand in Las Vegas, whose casino regularly hosts video game tournaments that, he said, “make a little bit of money.” But Schorr said the tournaments offer other revenue opportunities, including suites for groups and meal packages.